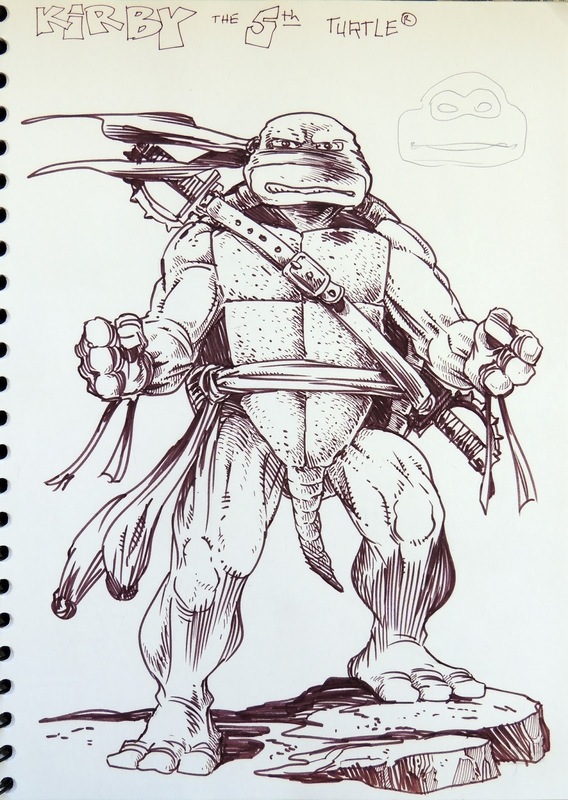 Peter Laird's TMNT blog: Blast from the Past #693: Sketchbook page 38, design for "Kirby, the 5th Turtle"
thank god that didn't happen, im praying the new turtle movie has more dimension X properties now that Shredder is a white guy, hopefully hes a utrom. Considering your general feelings on other Turtles, I have to ask, Mr. Laird: what are your thoughts on Slash? He's quite a popular character that has appeared in almost every incarnation of TMNT except for Mirage and 4Kids (and I'm somewhat curious if your "no extra Turtles" rule had anything to do with this). Since Kevin Eastman created him originally, I'm surprised no one at Mirage attempted to use him in the comics or anything. Kirby could've been a potentially cool idea, provided his origin wasn't just "another Turtle in the bowl that got lost, etc." as you said. I guess it's just as well, though. I know you don't like the idea of the 5th turtle (and frankly so do I). But, I like how this seems to free up the artist to do stuff that usually isn't standard. I dig the sword handle, similar to a Triceraton weapon. Did you have a problem with the comic/tv show aiming for a more commercial angle compared to your original comic? I remember reading an interview with Kevin where he said he didn't really care, but that you might have cared more about it. Also, did you envision the race of the characters such as the turtles, splinter, Shredder? Did you think that they should all be caucasian? "Did you have a problem with the comic/tv show aiming for a more commercial angle compared to your original comic? I remember reading an interview with Kevin where he said he didn't really care, but that you might have cared more about it." I only had a problem with it when I felt that it was getting way too goofy and silly, and missing what I saw as some great opportunities to tell stories which could be dramatic as well as humorous. "Also, did you envision the race of the characters such as the turtles, splinter, Shredder? Did you think that they should all be caucasian?" Thanks for answering. I wasn't trying to pull your leg. I think on the TV show Splinter was a human so I got mixed up. And I thought you may have "imagined" the turtles as humans, if that makes any sense. Anyway, I don't like that Shredder and many others will be caucasian in the movie. Do you have any thoughts on that? I know that when you guys originally drew the turtles, it was done for self-amusement. But when you guys drew the very first comic, what were your motivations for that? I'm curious to know what went through your mind...eg. just having fun with Kevin, or seriously trying to make money, or wanting to entertain lots of people etc. Some artists tend to only care about "artistic integrity" while others just want to give people what they want. It's something I struggle with. Any words of wisdom would be appreciated. "Thanks for answering. I wasn't trying to pull your leg. I think on the TV show Splinter was a human so I got mixed up. And I thought you may have "imagined" the turtles as humans, if that makes any sense." 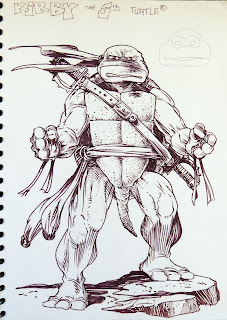 Aside from an idea Kevin and I kicked around where MIchelangelo would have masqueraded as a human in order to move around among them undetected, I can't recall ever trying to visualize the Turtles as human beings.
" Anyway, I don't like that Shredder and many others will be caucasian in the movie. Do you have any thoughts on that?" It seems a bit odd to make the Shredder white… but it might work in the new movie. I'll wait and see. I'm more concerned by how much what has been officially released about the new TMNT movie seems to closely resemble the contents of that awful script which was floating around the Internet some time ago. But who knows? It could turn out great. I'm hoping it does. "I know that when you guys originally drew the turtles, it was done for self-amusement. But when you guys drew the very first comic, what were your motivations for that? I'm curious to know what went through your mind...eg. just having fun with Kevin, or seriously trying to make money, or wanting to entertain lots of people etc. Some artists tend to only care about "artistic integrity" while others just want to give people what they want. It's something I struggle with. Any words of wisdom would be appreciated. " Thanks that's interesting to know. Just one last question for now...when you were coming up with the stories/characters etc and doing that first comic...even before you actually published it, were you really confident and sure that fans were going to embrace it or react to it? One thing about Slash though is he wasn't a random 5th Turtle in the same bowl as the other four. I agree with his stance though, retconning that there were always 5 turtles is just a bad idea. I never thought a 5th turtle would be a good idea. Slash I can understand from a villain standpoint. Adding in another hero turtle would ruin the dynamic that makes TMNT so great. What personality could you give this other Turtle that isn't already had by the four existing? Now if he were from a parallel dimension type scenario that would be better but I think you would need 4 turtles once again. As a single turtle I'd only see the 5th working as if he were somewhat similar to a Casey Jones type character. Rogue Vigilante . Has somewhat of a role within the group but very minimal. Rarely would they cross paths or team up. Could make for a great micro series. I still cross my fingers you might put out more TMNT comics eventually. Just...such good stories, and REAL characters.